The W62020X6 is one of Cartier's Roadster series model for men. This stunning Chronograph combines elegant lines with bold, energetic styling for a look that's masculine yet refined. This Cartier is protected by scratch resistant sapphire crystal with case diameter of 40 mm. This timepiece also comes with the large polished steel case is featured on a polished steel triple link bracelet with brushed center links and a hidden, deployment clasp. An additional black leather strap, instantly interchangeable using Cartier's patented system, is also included. Luminous black sword hands, luminous markers, and bold black Roman numerals stand out against the ivory dial, which is etched with concentric rings for a sporty driving watch look. A black chronograph seconds hand and three oval subdials display the chronograph functions, which include seconds, minutes to 30, and hours to 12. The dial also features a magnified date window at the three o'clock hour. A prominent polished steel cabochon crown completes the signature look. 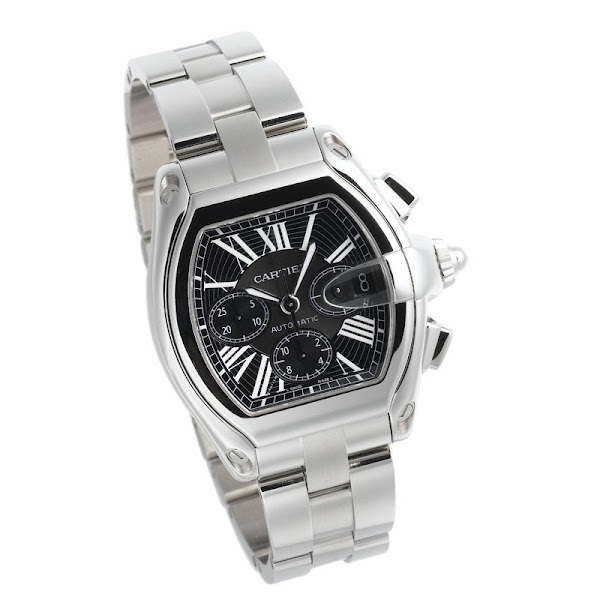 This watch is powered by Cartier's own Calibre 8510 Swiss automatic movement. In case you'd like to order yours, just saying, this 330 feet water resistant Cartier Roadster's original price is $8,575. You can find an original Cartier W62020X6 Watch at the site(s) listed above. However, we don’t guarantee its availability as being listed here simply means that those site(s) has the item in question by the time we wrote the review.